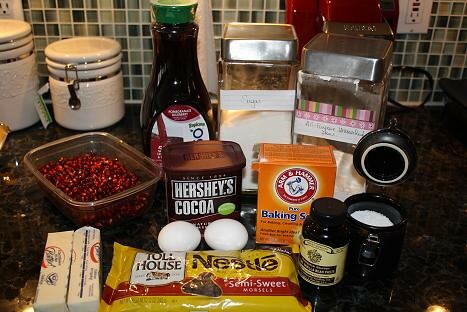 These are the ingredients I used for these cookies. I made two slight deviations from the recipe. First of all, the recipe calls for Pomegranate Juice, but I could only find Pomegranate Blueberry juice. It worked perfectly and I didn’t taste any blueberry flavors. Second, I substituted vanilla bean paste for vanilla because I got this from my mom for Christmas and really wanted to try it out. It’s great, because you just use the same amount of paste that the recipe calls for of vanilla extract. 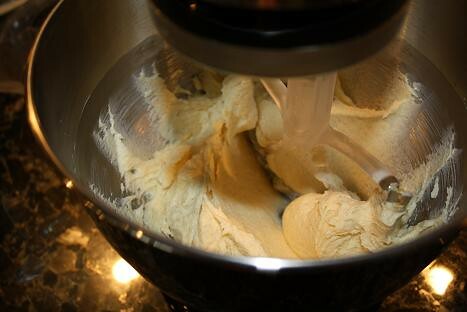 In my stand mixer, I combined softened butter, sugar, eggs, and vanilla paste until it was fluffy. If you look really, really closely, you can see little bits of vanilla bean…sigh! 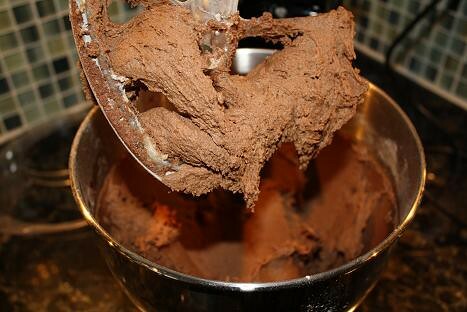 Next up, I added the flour, cocoa, baking soda, and salt with the butter mixture. Once that was well combined, I added the pomegranate blueberry juice to the batter. 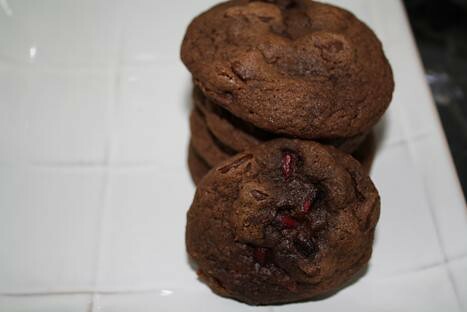 Finally I poured the chocolate chips and pomegranate arils into the batter and carefully folded them in by hand. After chilling the batter in the microwave for 2-4 hours, they were then set up enough to roll them into balls. I preheated the oven right before I took out the cookies, and it was heated up just as I finished rolling the cookies. If you make the cookies a little larger than I did, you should be able to get 24 servings out of the batch. I ended up getting 36 cookies out of this batch in the end. Biggest tip for this recipe: Please let these cookies cool on the cookie sheet at least ten minutes before attempting to put them on a cooling rack! Otherwise they will fall apart. Also, if you enjoy cooking/baking, I highly recommend investing in a Silpat. It has been invaluable to me. 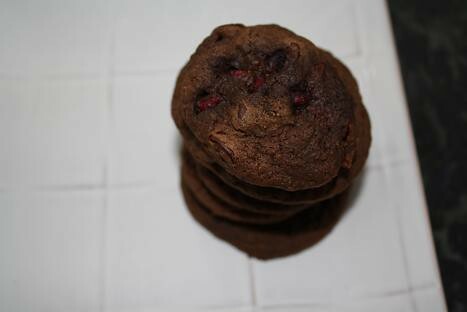 These cookies stay soft and chewey even after cooling and eating them the following day. So darned tasty!! 1. Cream butter, sugar, eggs and vanilla until fluffy. 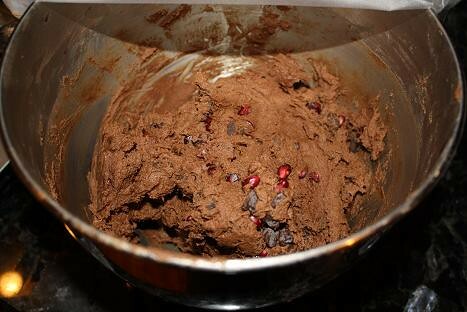 Add flour, cocoa powder, baking soda and salt, then pomegranate juice and mix until combined. 2. 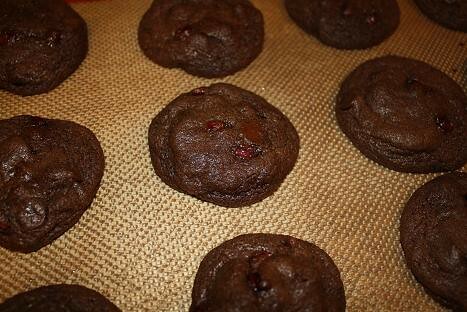 Fold in chocolate chips and arils. Refrigerate dough for 2-4 hours (or more). 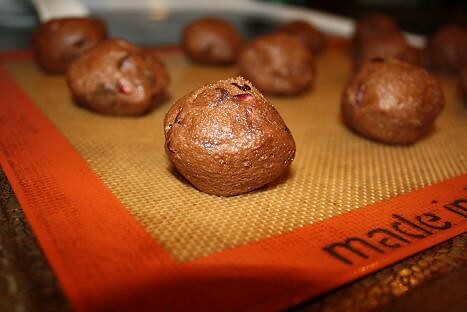 When ready to bake, preheat oven to 350F, roll into balls and set on a baking sheet. 3. Bake at 350F for 8-10 minutes. Let cool completely.